Qualion is a geometric sans serif typeface created by Roch Modrzejewski and published by ROHH. 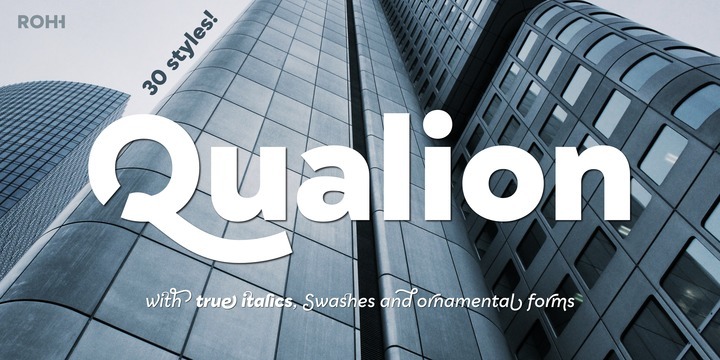 Available in 30 styles, 10 weights (from ) with accompanying oblique and italic styles, Qualion comes with a wide range of OpenType features and multilingual support. Similar to XII Centar, Qualion is a versatile font with a humanistic touch making it suitable for any kind of project such as display use, branding, logo, text etc. Enjoy Qualion! Trademark: “Qualion” is a trademark font name of ROHH. A font description published on Monday, February 5th, 2018 in Fonts, Roch Modrzejewski, ROHH by Alexandra that has 2,785 views.